“If we were to draw a line in the sand at January 2018, I believe that the property market of Cairns will perform better than most locations in Australia over the next 3 years, including better than Queensland’s capital city,” said Propertyology’s Head of Property Market Research, Simon Pressley. Australia’s sixteenth largest city is home to the nation’s fifth busiest airport (approximately 5 million passengers per year). Cairns is Australia’s gateway to the Asian Century and the exciting opportunities that exist with the rise of Asia’s middle class. Cairns’ assets include an international airport, a major sea port, a number of unique tourism attractions (on land and offshore), world-class facilities for hosting major events and business conferences, recent investment in universities, and an abundance of agricultural assets in the region. Propertyology’s buyer’s agents team are very familiar with the Cairns market. We’ve already purchased numerous properties there for our investor clients. I’ve personally invested in Cairns! The popular tourism mecca has added important economic diversity over the last decade. Education, health, and the construction sectors have evolved. The navy is Cairns’ biggest employer. The federal government recently committed $120 million for new infrastructure and a major naval base expansion. Extra marine manufacturing and maintenance jobs are expected from the $200 billion fleet upgrade for Australia’s Defence Force. James Cook university and, more recently, CQ university have expanded their infrastructure and are attracting more domestic and international students. In July 2016, Cairns became headquarters for a new federal government department, administering the $1 billion Northern Australia Infrastructure Fund. 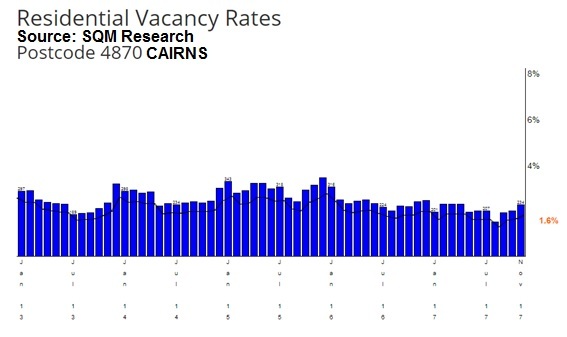 There’s already been 11,700 new jobs created in Cairns over the last 2 years. This 11.2 per cent increase is well above the national (3.7 per cent) and state (3.4 per cent) average. A large pipeline of major projects means that an additional 10,000 new jobs is anticipated in the next 12 months. 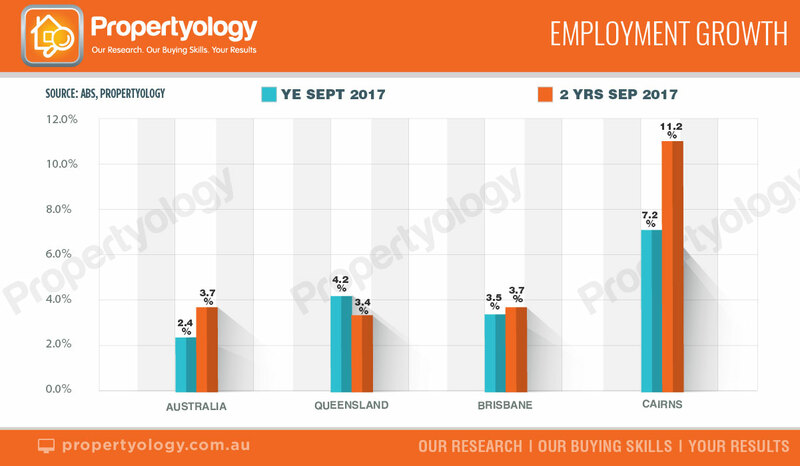 Commencing in 2018, Propertyology anticipates a jobs BOOM to drive employment growth, local confidence, and property prices for a few years. Among an extensive list of major projects are the $120 million port expansion, 3 new 5-star hotels, and a $650 million eco resort. A $175 million expansion of the Cairns Convention Centre will increase capacity for major events such as the Amway China Leadership Seminar for 8,000 delegates in 2019. $475 million is to be invested on three major renewable energy projects (Mt Emerald wind farm, Lakeland solar farm, and MSF Sugar’s bagasse-fuelled power station). 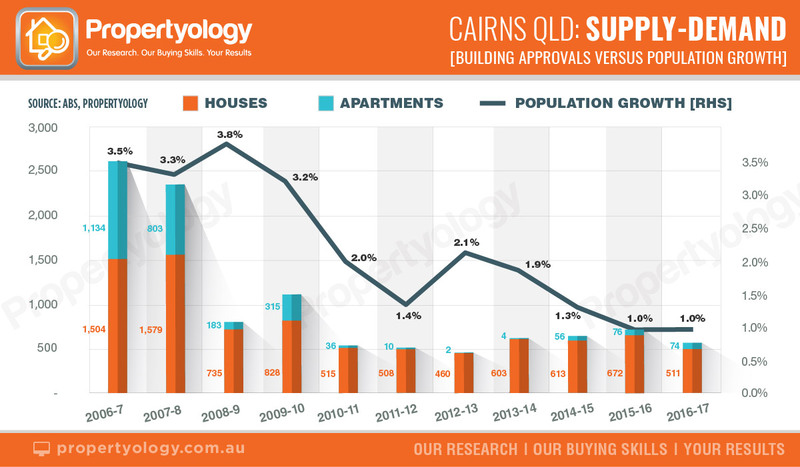 Housing supply has been quite tight in Cairns for several years. Residential vacancy rates have been consistently below 1.5 per cent for 5 years, easing even further over the last 18 months to currently be 1.3 per cent. Since 2010, only 450-700 new dwellings have been approved each year. This low volume of new housing supply combined with affordability and jobs-driven demand is the perfect combination for property price growth. Our buyer’s agents have focused on 3-4 bedroom houses within a few select pockets. With the typical purchase price in the low $400,000’s and rental yields of circa 5 per cent, the annual holding costs are so affordable that even those borrowing 90 per cent only have to find $3,000 per year. And, the potential for growth is as exciting as anything in Australia!